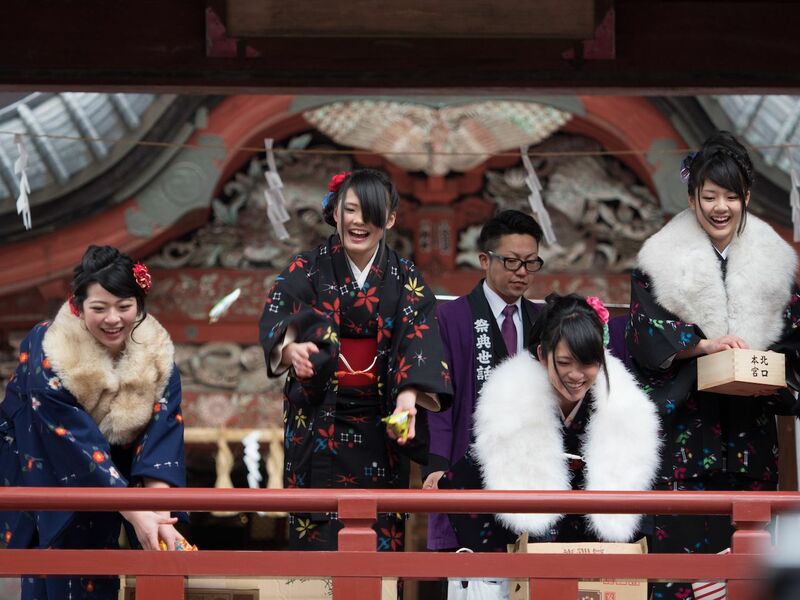 Everyone enjoys music festivals , New Year’s Eve celebrations, and traditional parades, but there’s one problem with those traditional events — you don’t get to throw stuff at people. Sure, you can throw beads during Mardi Gras, but that’s nothing compared to the unbridled mayhem of the festivals where the whole point is to pelt fellow participants with a variety of messy substances. 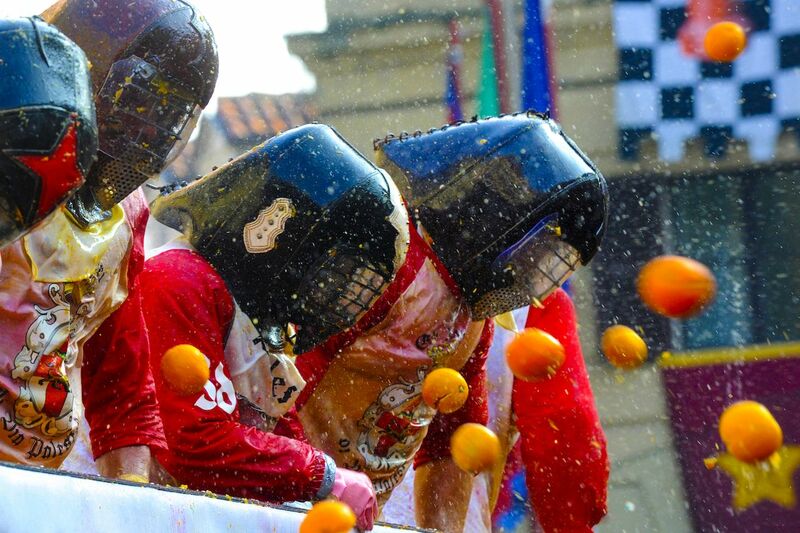 From a food fight with oranges in Italy to tomatoes in Spain, here are seven of the craziest festivals around the world where people throw things at each other. Every year on the last Wednesday in August, thousands of people gather in the town of Buñol in Spain to throw squashed tomatoes at each other. 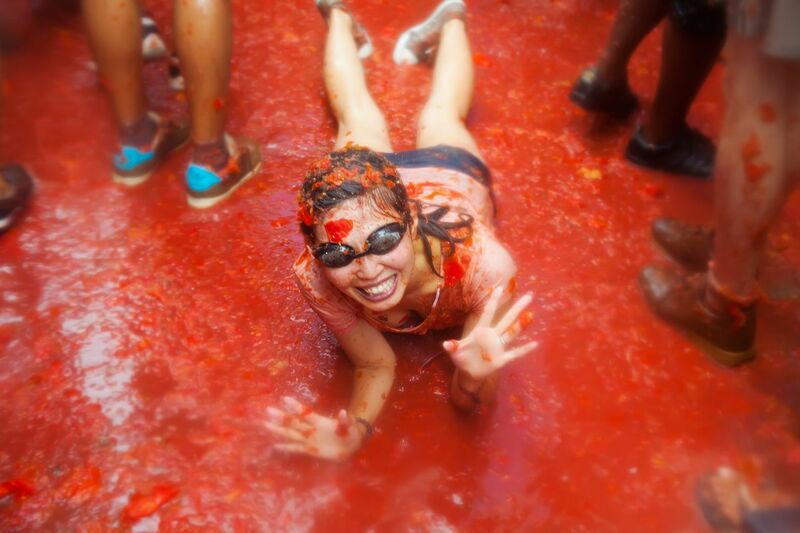 Rumors says that La Tomatina began in 1944, when children threw tomatoes at a bad musician and the situation quickly escalated into a food fight, but no one is quite sure how the annual event really began. What we know is that it’s one of the most fun celebrations anywhere in the world, but if the festival itself is not enough excitement for you, there’s also a party at a nearby club before and after the event. If you’re looking for an excuse to return to the summers of your youth, and play with water balloons and Super Soakers, then you need to get yourself to Thailand between April 13th-15th. 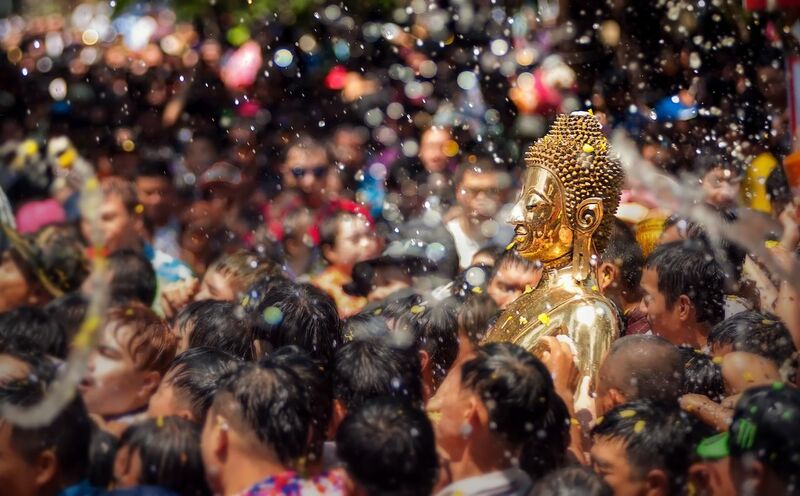 At the Songkran Festival, mainly taking place in Chiang Mai, Bangkok, and Phuket, people take to the streets to soak each other with water guns, hoses, and buckets. The festival is rooted in Buddhist tradition, which says that water has purifying properties, and can wash away evil spirits. Ivrea is a small town in northwest Italy that gathers over a million pounds of oranges each year for its annual Battle of the Oranges. The battle is made up of squads of orange throwers on foot and groups in carts defending their vehicles from the throwers. In total, there are around 4,000 total competitors who spend the day hurling oranges at each other and have been doing so since 1808. The event commemorates the revolt of the people of Ivrea (the orange throwers) against the tyranny of the Royal Napoleonic Troops (the people in the carts), after hated despot Raineri di Biandrate got killed by a miller’s daughter who refused the jus primae noctis. The battle will take place on March 2nd-5th, 2019, and if you don’t feel like taking an orange to the face, you can always just choose to be a spectator (or wear a mask). 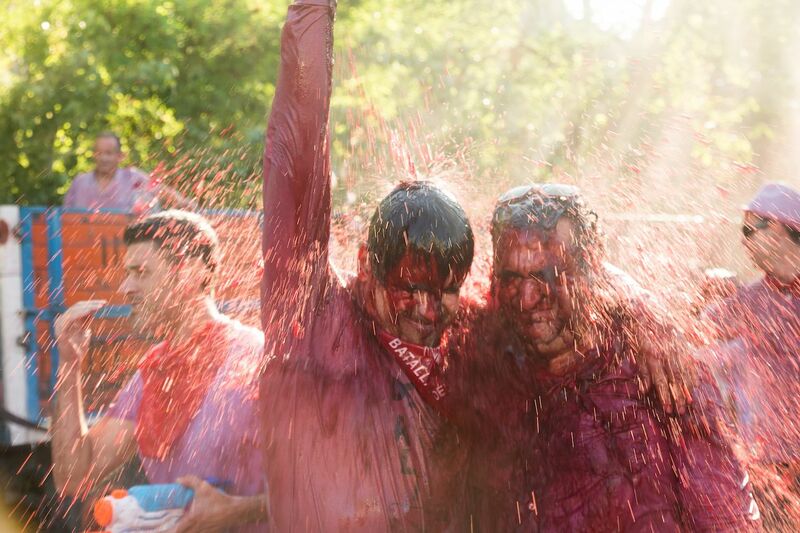 The Haro Wine Festival in La Rioja sees hundreds of people, equipped with leather satchels filled with red wine, climb a mountain to pour it all over each other. The celebration dates back 400 years to a battle in the 13th century, when the Haro and Miranda de Ebro regions fought over their borders. Originally Haro celebrated its victory with a red wine toast, but it’s now evolved into a wine fight. The event takes place every June 29th at 7:00 AM, and we can’t really imagine a better way to start the day. The festival’s website describes the event as “the biggest party that the quaint town of Haro sees,” and when the wine dousing is done, the day is capped off by traditional dancing on the streets below the mountain. Perhaps one of the most fun and vibrant celebrations in the world, Holi is called the Festival of Colors for good reason. 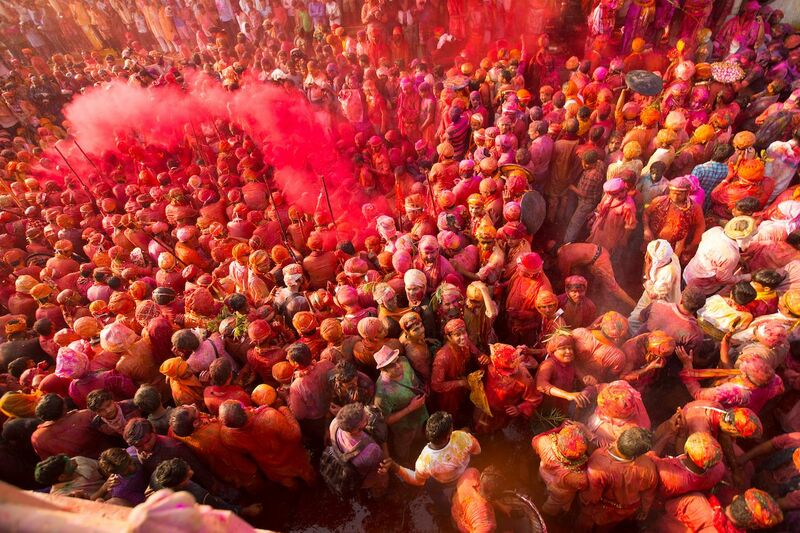 This year it’s from March 20th to 21st, 2019, and on the second day of Holi, participants converge in massive numbers all across India to cover each other with bright, powdered dye. According to National Geographic, this tradition is rooted in Hindu deity Krishna’s jealousy over his sister Radha’s fair skin (Krishna is quite blue). When Krishna complained to his mother Yashoda about this injustice, she supposedly replied that Krishna may paint his sister’s face whatever color he wished. The colors used during Holi carry meaning; red dye symbolizes love, fertility, and matrimony, while blue represents Krishna. While many might see this festival as a tragic waste of dessert, the British seem to revel in the opportunity to throw pies at their fellow countrymen. Originally conceived as a way of raising funds for the village hall nearly 50 years ago, the competition now attracts participants from around the world. Players are divided into teams of four, with judges awarding points to those who strike their opponents directly in the face. While fancy dress is optional, it’s customary to dress either in Victorian garb or futuristic outfits. Taking place in the village of Coxheath, the event has been held annually since 1967. It’s estimated that a staggering 3,000 pies are thrown each year. This Japanese festival traditionally marks the beginning of spring, though it has nothing to do with cherry blossoms. On February 3rd, people all over Japan will take roasted soybeans, and either throw them out the window or at members of their family dressed as demons. Since beans are thought to represent vitality and purity, the bean-throwing is believed to cleanse the evil of the previous year, and mark the start of a fresh Lunar New Year. The tradition began back in the 14th century, and it’s still a favorite, especially with children.